Difference between revisions of "Zest"
This is a collection of documentation on Zest 2.0, the latest development version of Zest. A nightly build of Zest 2 can be installed from our [https://hudson.eclipse.org/hudson/job/gef-zest-nightly/lastSuccessfulBuild/artifact/targetPlatform/ p2 repository]. The Zest 2 source code is available from the [http://git.eclipse.org/c/gef/org.eclipse.gef4.git/ GEF4 Git repository]. It is also [https://github.com/eclipse/gef4 mirrored on GitHub]. There are example snippets in ''org.eclipse.gef4.zest.examples'' and tests in ''org.eclipse.gef4.zest.tests''. For instructions on contributing, see the [[GEF/Contributor Guide | GEF Contributor Guide]]. You can search for [https://bugs.eclipse.org/bugs/buglist.cgi?list_id=4722702&classification=Tools&query_format=advanced&bug_status=UNCONFIRMED&bug_status=NEW&bug_status=ASSIGNED&bug_status=REOPENED&component=Zest&product=GEF existing bugs], or [https://bugs.eclipse.org/bugs/enter_bug.cgi?product=GEF&component=Zest file a new one]. Finally, attach your patch to the corresponding bug, in this case bug 321775. You can search for [http://bugs.eclipse.org/bugs/buglist.cgi?query_format=advanced;component=Zest;product=GEF existing bugs], or [http://bugs.eclipse.org/bugs/enter_bug.cgi?component=Zest&product=GEF file a new one]. The complete sample usage is [http://git.eclipse.org/c/gef/org.eclipse.zest.git/tree/org.eclipse.zest.tests/src/org/eclipse/zest/tests/dot/SampleUsage.java available in the repository], as well as [http://git.eclipse.org/c/gef/org.eclipse.zest.git/tree/org.eclipse.zest.tests/resources/tests DOT input samples]. The complete sample usage is [http://git.eclipse.org/c/gef/org.eclipse.gef4.git/tree/org.eclipse.gef4.zest.tests/src/org/eclipse/gef4/zest/tests/dot/SampleUsage.java available in the repository], as well as [http://git.eclipse.org/c/gef/org.eclipse.gef4.git/tree/org.eclipse.gef4.zest.tests/resources/tests DOT input samples]. Instead of ''org.eclipse.zest.layouts.Filter'' use ''org.eclipse.zest.core.widgets.LayoutFilter'' (see example below and full code in [http://git.eclipse.org/c/gef/org.eclipse.zest.git/tree/org.eclipse.zest.examples/src/org/eclipse/zest/examples/swt/GraphSnippet8.java GraphSnippet8.java] in the examples bundle). Instead of ''org.eclipse.zest.layouts.Filter'' use ''org.eclipse.zest.core.widgets.LayoutFilter'' (see example below and full code in [http://git.eclipse.org/c/gef/org.eclipse.gef4.git/tree/org.eclipse.gef4.zest.examples/src/org/eclipse/gef4/zest/examples/swt/GraphSnippet8.java GraphSnippet8.java] in the examples bundle). To define custom layouts, instead of extending ''AbstractLayoutAlgorithm'' implement ''LayoutAlgorithm'' (see example below and full code in [http://git.eclipse.org/c/gef/org.eclipse.zest.git/tree/org.eclipse.zest.examples/src/org/eclipse/zest/examples/swt/CustomLayout.java CustomLayout.java] in the examples bundle). To define custom layouts, instead of extending ''AbstractLayoutAlgorithm'' implement ''LayoutAlgorithm'' (see example below and full code in [http://git.eclipse.org/c/gef/org.eclipse.gef4.git/tree/org.eclipse.gef4.zest.examples/src/org/eclipse/gef4/zest/examples/swt/CustomLayout.java CustomLayout.java] in the examples bundle). The ''IConnectionStyleProvider'' and ''IEntityConnectionStyleProvider'' interfaces now contain ''getRouter'' methods returning an ''org.eclipse.draw2d.ConnectionRouter''. Return ''null'' for the default router. 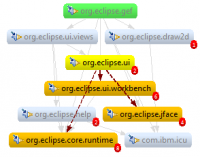 See [http://git.eclipse.org/c/gef/org.eclipse.gef4.git/tree/org.eclipse.gef4.zest.examples/src/org/eclipse/gef4/zest/examples/jface/ManhattanLayoutJFaceSnippet.java ManhattanLayoutJFaceSnippet.java] in the examples bundle. Note to non-wiki readers: This documentation is generated from the Eclipse wiki - if you have corrections or additions it would be awesome if you added them in the original wiki page. Documentation on Zest - The Eclipse Visualization Framework. For general information visit the Zest home page. Documentation on getting started with Zest 1.x, the latest released version of Zest, can be found on the Zest 1.x wiki page. Further documentation is available under the GEF category. The Zest 2 source code is available from the GEF4 Git repository. It is also mirrored on GitHub. There are example snippets in org.eclipse.gef4.zest.examples and tests in org.eclipse.gef4.zest.tests. For instructions on contributing, see the GEF Contributor Guide. You can search for existing bugs, or file a new one. Each subgraph is represented as a separate graph item: a label showing the number of nodes contained within it. It can be subclassed to show other kinds of information. Each subgraph is represented as a triangle. It's designed specifically to work with SpaceTreeLayoutAlgorithm (see below) and assumes that nodes pruned inside it form a tree structure. Properties of this structure are visualized by properties of the triangle. The height of the triangle corresponds to the height of the tree, the length of the triangle's base corresponds to the total number of leaves in the tree and the luminance of the triangle's color corresponds to the average number of children for each node in the tree (which can be understood as the density). Each subgraph is represented as a little label showing how many direct successors are pruned. SpaceTreeLayoutAlgorithm keeps track of node positions all the time, always trying to form a nice tree structure. This means movement of nodes with the mouse is somehow restricted (you can move a node within its current layer, but only if it doesn't cause nodes to be pushed out of the graph area. When an expand operation is requested on a node, the node is centered and its subtree is shown, as long as there's enough space (other parts of the tree can be collapsed to extend available space). DirectedGraphLayoutAlgorithm was designed with the PDE Dependency Visualization in mind and is based on its layout algorithm. Initially only nodes without predecessors are expanded. Other nodes become visible if they have at least one direct predecessor which is visible and expanded. Collapsed nodes can have outcoming connections if the target node is visible because of a predecessor. There's an option to hide such connections. In Zest 2, graphs can be created from DOT input. For instance, for the following DOT input, the Zest graph below is drawn, see also the complete documentation. 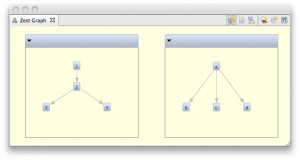 The Zest graph view can be used with the included DOT editor to visualize a DOT file or to display embedded DOT in other files, e.g. in source code comments or in wiki markup. Using the API, DOT can be imported to Zest graphs, and Zest graphs can be exported to DOT (see below). To use the API, create a new Plug-in project and add org.eclipse.zest.dot.core to the MANIFEST.MF dependencies. The complete sample usage is available in the repository, as well as DOT input samples. In Zest 2, the layout API has been reworked. Most code should keep working just fine. See the Javadoc of the deprecated API for documentation on migrating to the new API. In a few cases however, code changes are required. Instead of org.eclipse.zest.layouts.Filter use org.eclipse.zest.core.widgets.LayoutFilter (see example below and full code in GraphSnippet8.java in the examples bundle). To define custom layouts, instead of extending AbstractLayoutAlgorithm implement LayoutAlgorithm (see example below and full code in CustomLayout.java in the examples bundle). The IConnectionStyleProvider and IEntityConnectionStyleProvider interfaces now contain getRouter methods returning an org.eclipse.draw2d.ConnectionRouter. Return null for the default router. See ManhattanLayoutJFaceSnippet.java in the examples bundle.